A snow storm on Monday night left us with chain controls and dense/freezing fog advisories in the Sierra Tuesday morning. Rather than risk life and dog, we rescheduled our appointment with Dr. Beebe in Sacramento to next week, since a trip to Sacramento means travel over the mountains from here. Meanwhile, acupuncture on Monday went well… and chemo today (Treatment #9) proceeded without a hitch. Jack’s had a pretty good week and looks amazing for an older guy with two terminal illnesses (we can’t forget about his heart disease in addition to everything else). We look back on the last 11+ weeks since his lymphoma diagnosis and are amazed at how well everything has gone. Linda came across the original paperwork from Dr. Rebhun when we first met him at UC Davis back in October, where he summarized our treatment options and prognoses for each one. Mostly, he cautioned us about the impact chemo could have on Jack’s heart. We know he was worried about that because no one could predict how the heart would react to chemo. We remember what a tough decision it was… and we remember many sleepless nights worrying whether we made the right decision. There are so many variables to consider, with Jack’s well-being and happiness the most important. Thankfully… and happily… everything has turned out as well as can be expected. Notwithstanding a few “bumps in the road,” Jack has not experienced the nausea and resulting dehydration we were warned about (dehydration from nausea would be tough on his heart). He has never missed a meal and eats with great enthusiasm. We have never had to postpone or cancel a chemo treatment due to a bad blood test – all chemo treatments have been right on schedule. He manages to recover from each treatment with only a few days of fatigue and a lot of sleep depending on the drug given. And most importantly, his eyes are bright, his weight is constant, his coat looks great, he’s still in remission, and he seems happy. It just doesn’t get any better than that. We expect to spend most of this weekend at home, since the drug he got tonight is the one that seems to make him the most tired by about day 3 (Saturday). Next week he has acupuncture on Monday and will see Dr. Beebe in Sacramento on Thursday. No chemo next week. 11 weeks and counting since diagnosis and Jack is going strong…this afternoon he was rolling around on the living room floor kicking his feet in the air like a goofy dog – always a good sign. This week will be a busy one for Jack – acupuncture with Dr. Rinehimer Monday morning, a checkup with Dr. Beebe in Sacramento on Tuesday (http://integrativeveterinarycenter.com) and Treatment #9 on Wednesday with Dr. Schneider. We’re pretty sure Jack is liking the extra week of rest between treatments, and so is our checkbook. We hope you had as much fun for Christmas as we did. On Christmas Eve day, Linda had to work so Jack, Jenny and John piled into the car and took Linda out for lunch – a nice sandwich at the Sonic Drive-in. Jack loves that place - there’s so much activity between the car-hops, the drive-thru, and the UPS trucks zipping around it's sensory overload if you’re a dog. Granted, the food isn’t exactly gourmet, but it’s edible and provides an opportunity for us all to spend some quality time together in a rather small space… It should also be noted that Jack rolled belly-up on his futon while napping on Thursday. This is a HUGE deal – one of the key signs that he’s feeling good is sleeping on his back and he hasn’t done so for several weeks. On Christmas Day Jack was not to be denied – he was taking Linda for a walk and that was all there was to it. So off they went heading for the mailboxes. When they reached the mailboxes, Jack turned and headed out into the park. At this point Linda decided to let Jack lead just to see where he would go. He proceeded to march out into the park, and then around the loop trail through the sagebrush. When he was younger he used to spend a lot of time out there, running with his doggie friends and chasing bunnies, but he hadn’t shown any interest in walking out there for several months so this was quite a surprise. So how far did he go? Those readers who are familiar with our park will know the trail out to the ‘dirt pile’ down which he trotted like he owned the place. Once they reached the dirt pile, he was heading out into the sagebrush when Linda decided to turn him back. A huge walk for Jack and as Linda said the best Christmas present she could have received. Not to be outdone, Jack was ready for more this morning so we loaded up and headed to Reno to do some shopping. Jack’s favorite trails are in south Reno and he was eager to walk again today, and again we had to turn him around when it was time to head back to the car. It’s very nice to see Jack engaged and interested in walks again. He seems to have a bit more stamina lately, and he doesn’t drag his toes or stumble when he gets tired like he used to – how much of this is attributable to the acupuncture we have no way of knowing but we believe it is helping him in a meaningful way. His next acupuncture appointment is on Monday, and chemo Treatment #9 is next week Wednesday – four days from now so we’ll see if we notice any differences with bi-monthly treatments. Nothing says “Christmas” like dog boogies…yes, unfortunately Jack’s sinus infection has returned with a vengeance. (Sorry, no photos of that one…) So, while we are all enjoying a week off from chemotherapy treatments Jack is taking another round of antibiotics. Dr. Schneider Schweet-heart’s (Jack’s words…) only comment was that it can be tough getting those out of the sinuses. There’s never a dull moment at our house. Meanwhile, like everyone else we’re looking forward to the Christmas Holiday and all of the family, friends, good food and good cheer that goes with it. But mostly we’re looking forward to spending the long weekend with Jack. 'Thank you' to everybody who reads the blog and sends emails of encouragement and support to Jack. It really means a lot to us. Over the next four days we’ll post as time permits, but for tonight we want to wish everyone a very Merry Christmas. This afternoon Jack had acupuncture and this evening he gave a very spirited attempt to play with Jenny (who was more interested in her toy than in Jack). She was laying in the living room, squeaking on her toy with Jack in the dining room, barking at her… and everyone’s tail was wagging. Jack looks good this evening and right now is on his futon, next to the computer, keeping me company as I type. Moments ago he was in the bathroom as I took a hot bath, keeping me company while I soaked. He’s never far from Mom. Today was Jack’s ‘sleep day’ – four days after Treatment #8. He slept all night, slept all morning, and slept most of the afternoon…until 3:00 when he decided that he’d slept enough. So Linda loaded him into the car and took him with her to run some errands. He stood the entire time – either helping Linda drive, or with his head out the window. He also barked up two motorcycles, and since they’ve been home, he’s been his usual self. We’re anxious to see how he does now that his treatments going forward will be every other week, rather than every week. Hopefully that will translate into a little more endurance and he can start to get back some of the muscle tone that has been lost over the last two months. His regular weekly acupuncture appointment with the vivacious and effervescent (Jack’s words…) Dr. Rinehimer is tomorrow afternoon, and he has a follow-up appointment with Dr. Beebe (our Integrative Veterinarian in Sacramento) on December 29th. And of course, Treatment #9 is scheduled for December 30. It’s been 10 weeks since diagnosis and we have to say, at this point, we have no regrets. Dr. Rebhun’s protocol has proven to be exactly right for Jack, he has experienced none of the nasty side-effects we were warned about (gushing blood out of his nose notwithstanding) and other than obvious signs of fatigue, he has remained ‘interested and engaged’ throughout. This week marks the half-way point in Jack’s treatment protocol, and while there are no guarantees the second eight treatments will go as smoothly as the first eight, we remain cautiously optimistic. What we do know is that Jack is here for Christmas, and we are enjoying every day that we are blessed with him. A few years ago we saw one of those little one-liners and it has always stuck with us: The value of life lies not in the length of days, but in the use we make of them. From that has grown our household mantra – ‘No wasted days.’ That has never been truer than it is now – with Jack, every day is a bonus. Following this week’s Treatment #8 at UC Davis, we expected Jack to be wiped-out this weekend. He slept a lot yesterday and slept well last night, but this morning he was bright-eyed with a good appetite for his breakfast. We decided to take advantage and go for a drive to Lake Tahoe for lunch at Kings Beach. When we arrived, we got the dogs out of the car to stomp around in the snow for a few minutes before we headed in for lunch, and Jack marched us all the way down the beach to the lake’s edge. The beach had about 8 inches of snow on it and the beach was wider than usual because the water level was low. 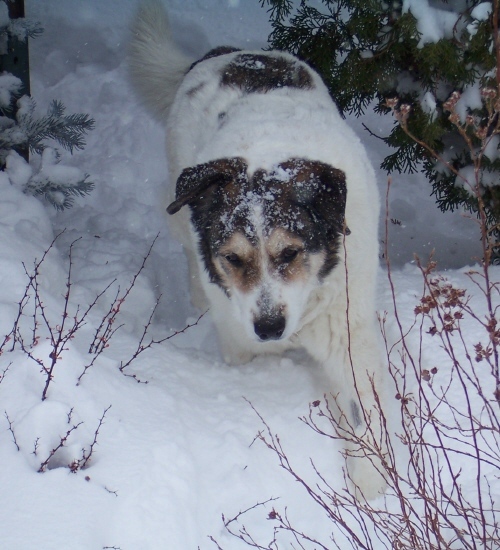 The walk down to the lake was several hundred yards, and Jack had no problem at all walking in the snow. He clearly enjoyed himself and wasn’t all that happy when Linda decided it was time to head back to the car (why am I always the “bad guy?”). This afternoon he napped in the laundry room while helping with the ironing. Jack follows us (mostly Linda) everywhere, from room to room, and is often under foot. He’s always been like this and we take it as a very good sign that this behavior hasn’t changed. Jack remains interested in what we’re doing and wants to be with us. We’ll see what tomorrow brings, and whether the after-effects of this week’s chemo treatment kick-in, but so far he’s handling this dose better than the last time (knock on wood… no bloody nose!). This week he gets a break from treatment – he doesn’t even have to go for a blood test if he’s feeling well! The only thing on his schedule this week is acupuncture Monday afternoon with Dr. Rinehimer. Jack submitted to his weekly blood test yesterday morning, and returned home to await the results. Dr. Schneider called in the afternoon to report that everything looked ‘good’ and we were off for UC Davis. Jack has always lived his life by fairly basic principals – when he’s hungry he eats, when it’s dark outside he sleeps, and when it’s light outside he’s pretty much ready to give anything a try. This makes traveling with Jack in the evenings drama-free; the sun goes down and he goes to sleep. End of story. The drive over the mountain was uneventful, and when we arrived in Davis there was just enough time to run over to Pluto’s for an order of roast turkey. Everyone slept well, and this morning we walked over to campus to stretch legs, empty bladders, and tree a couple of squirrels before heading to the clinic for Treatment #8. We met briefly with Dr. Rebhun to discuss Jack’s blood counts and low-level anemia and were happy to learn that his anemia may not get any worse – this is typically the point in the treatments where the blood counts are the lowest. In fact, there’s a chance we may see improvement now that the next eight treatments will be every two weeks rather than weekly. The UC Davis small animal clinic is a pretty busy place – on any given day you never know what you will see. The biggest dog we’ve seen was an Irish Wolf Hound (all 200 lbs of him), lots of Labs and Cockers, and of course cats of all makes and models. But not all patients are dogs and cats…on one visit we saw a chinchilla, another time we saw a goose in a dog crate (strange noises coming out of that box for sure), and today it was a beautiful green parrot named Lola in a cat carrier. No matter what the species, no matter what the ailment, the staff handles every one with incredible care and compassion. Because Jack had his blood test and we drove over the mountain the day before our appointment, we arrived at the clinic early in the morning, and Jack moved to the front of the line. That also meant that his treatment was done before lunch and we were able to finish the drive home over the mountain in the daylight. Today’s results after Treatment #8: Jack looks great and feels good, he’s ‘interested and engaged,’ and his lymphoma is still in remission. And on the way home, when not helping John drive or barking at UPS trucks, he enjoyed a nice nap on his pillow. With all the snow everywhere (which now has an especially thick crust and is virtually impossible to walk on), the dogs haven’t ventured far on foot. Linda decided to take Jenny with her to the mailbox (about two blocks away), so at least she could get out and get some exercise. The thick, icy snow chunks from the snow plow are piled up in the gutters and sidewalks, making the street the only place to walk. Complicating matters is that they chip-sealed our street about 6 weeks ago, so the street itself is more gravel than pavement and Jack’s not fond of walking on gravel. For all of these reasons, it was best for Jack to stay home and rest. Yeah, right. For anyone who has wondered whether Jack is “interested and engaged,” here’s proof. Linda quietly reached for Jenny’s collar and leash, and as soon as Jack saw it, he jumped up and came over with a wagging tail… waiting to be leashed-up. So the plan then became to walk as far as John shoveled our sidewalk (we live on a corner), and bring Jack home before heading back out with Jenny. It’s important to note that our mailboxes are at the common-area park, where trails lead past a grassy lawn and out into the sagebrush. This is where Jack has gone for walks for the last 9 years although we haven’t ventured out there in several months. By the time we got to the corner in front of the house – the pre-determined point to turn back – Jack decided he was going to the park and off we went. He didn’t walk fast and he had a hard time with the ruts of snow, ice water puddles, and loose gravel on the street, but he was not to be deterred. As soon as we reached the mailboxes, Jack headed out into the park. There was a nicely packed path in the snow that made walking much easier, and he marched out several hundred yards before Linda decided it was time to turn back. That’s about the farthest Jack has walked in at least a couple of weeks, and John thinks this shows the value of acupuncture. So kudos to Dr. Rinehimer and her magic needles. Meanwhile, e-mail consultation with Dr. Rebhun at UC Davis determined that it would be best to postpone this week’s chemo treatment (Treatment #8) to Thursday, making it a full 7 days from his last treatment. That’s fine with us, since the weather on Thursday will be much better than Wednesday. We’re really not in the mood to head over the Sierra in a snow storm. Nine weeks and counting since diagnosis…you can say that we’ve settled into somewhat of a ‘routine’ – as much as one can when working through a chemotherapy protocol. The nose-bleed issue has thankfully not repeated itself and we have added high blood pressure to our list of things to watch, and with it has come a new medication. With so many variables in the mix, it’s hard to say what causes any one ‘trouble’ but last night Jack had an upset tummy. He seemed fine during the day yesterday, and seemed fine today, but last night was a little rough for him. His appetite remains strong, and he continues to be ‘interested and engaged’ in everything around him. This week is the last of the weekly treatments and that’s a good thing – Jack is really worn out. We are cautiously optimistic that he will continue to tolerate the treatments as well as he has, and with treatments every other week he will have a chance to overcome the fatigue factor. Tomorrow he sees Dr. Rinehimer for acupuncture, Tuesday morning is his weekly blood test, and if all is well, Wednesday morning he will see Dr. Rebhun for Treatment #8 (mitoxantrone) at UC Davis. Today is the day after Vincristine when Jack is the most tired. We’ve noticed it with his earlier treatments, and this one was no different. It’s really challenging to write something interesting or funny about sleeping all day, with the occasional rally around mealtime. Something Dr. Schneider asked us last week has really resonated – is Jack ‘interested and engaged?’ The answer is a confident ‘yes.’ He keeps a close watch on where we are and what we’re doing, and will relocate his napping spot to make sure he’s with us at all times. As for meals, he doesn’t let us forget what time it is, and continues to be fully engaged when it comes to food preparation. From these simple yet important behaviors we believe that fatigue is still the only serious side effect of his chemo treatments. We would be remiss if we failed to mention that Jack was rescued from certain death in the desert and came to live with us nine years ago yesterday. What a wonderful journey it has been for all of us. Thank you Aunt Marla! Jack was back at the vet this morning for Treatment #7 – Vincristine. As Dr. Schneider put it – Jack’s getting tired of Vincristine…and Vincristine makes Jack very tired. Seems like an ironic sort of relationship, but one we’ll live with to keep Jack living with us. His blood pressure was high again this morning, so Dr. Schneider is calling Dr. Hosking (cardiologist) for a consult. There should be a medication available to us that will target his blood pressure while not upsetting the delicate balance of chemo and heart meds. If it sounds complicated, that’s because it is…good thing Jack has such a great team of vets who care about him as much as we do. Treatment #7 has been delayed until tomorrow morning. After braving the ice, snow, and single-digit temperatures on our trek to the vet we learned that their blood machine was on the fritz, so the sample had to be sent out and results are due back tomorrow. However, it was not a wasted visit. After giving Jack a thorough once-over Dr. Schneider pronounced that Jack’s heart sounded good, his pulse was strong, his gums looked good, and his lymph nodes felt normal. While his blood pressure was high, she was not too worried and will re-check in the morning. Overall, she stated that Jack is doing well for a dog at this stage of chemotherapy. When we left for work this morning at 6:30, the thermometer in the car gave us shocking news. It was -10 degrees (yes, that’s MINUS 10 degrees F). When Linda drove home for lunch, it had warmed to a balmy and semi-tropical 11 degrees – break out the swimsuits. As of this writing at 6:45pm, it’s 2 degrees. At some point this afternoon, he decided it was time to nest on Mom and Dad’s bed… this time on Mom’s side. No doubt it was a warm and comfy place to spend the afternoon! Anticipating Treatment #7 tomorrow at 4pm, pending the results of the blood test. Wednesday is Treatment #7 (Vincristine) if his blood count is good, and next week we’re back to UC Davis for Treatment #8. This is significant because after #8 the treatments back off to every-other week which should give his body a better chance to recover. With chemo every week he just reaches the nadir from one drug when it’s time for the next. So far, so good – still no severe reactions or side effects, just very, very tired. Jack was feeling a bit feisty this morning… and the weather was nice… so we decided to take a day‑trip to Davis and a walk around the UC Davis campus. There are always a lot of squirrels to chase on campus, and the Pluto’s restaurant downtown has awesome roast turkey. Mom and Dad have been known to get an order of turkey (or two) just for Jack and Jenny. 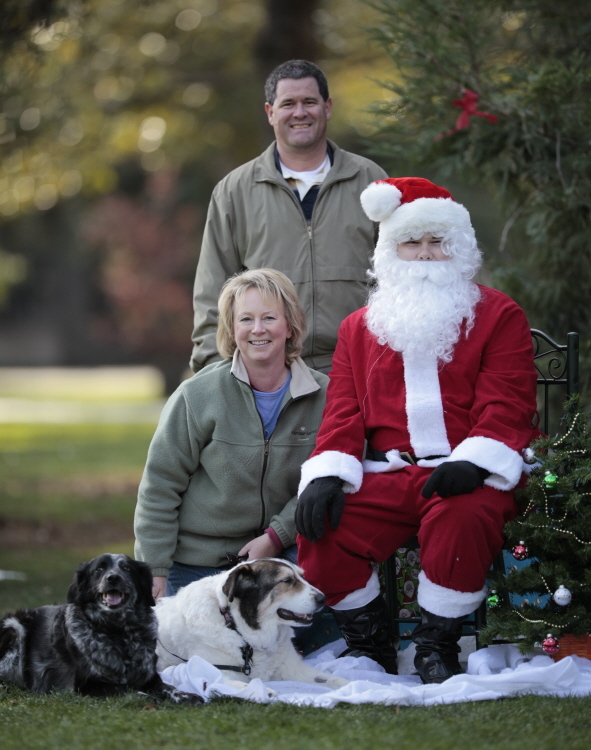 So there we are, walking around the Quad on campus, and there was Santa playing with a dog by some big pine trees. As we got closer, a nice young lady asked if we were there to have our photo taken with Santa… it’s a fund-raiser for the UCD Vet Aide Club (pre-vet students). How could we say no? Jack and Jenny posed nicely with Santa for some great photos, and then we headed over to the picnic tables to see the photos on a laptop with a group of club members. Of course, they had to see the website and hear Jack’s story. The rest is history. Jack has always been (according to John) a “Babe Magnet” and he hasn’t lost his touch. In no time a crowd of lovely young ladies started taking pictures of Jack, petting Jack, giving Jack treats, hugging Jack… Jack was in his element. He was a bit tired at this point (it had already been a big walk) so he sat there and soaked up all of the attention. When we finally left, Jack had several new girlfriends and a CD full of great photos. In case any of the students check the blog… Jack wants to send a giant SHOUT OUT to his new friends in the Aggie Vet Aide Club at UCD! Aggie Pride! Thanks for making our day so special. Treatment #6 ended tonight with the third dose of cyclophosphamide pills following supper. So far, Jack’s reaction has been pretty much the same as the first round although he seems a bit more fatigued. In fact, if we had to pick one word to describe Jack’s overall reaction to chemotherapy it would be fatigued. He has shown no signs of nausea, the input/output systems are working with very little upset, he remains interested in being in the middle of all household activities, and certainly loves his rides in the car. He even initiates play with Jenny from time to time – he just doesn’t have the stamina that he used to have. We’re grateful for every day we have together, and if we can still do many of the same things we’ve always done – just for shorter periods of time – we’re ok with that. And now a few words about Diet. We are completely sold on the dehydrated diet from Honest Kitchen, which comes in several varieties (no-grain, low carbs, gluten-free, complete meals, or a base mix to which you add your own protein). (www.thehonestkitchen.com) We didn’t know before Jack’s diagnosis that low-carb meals are recommended for cancer dogs, because cancer apparently feeds on carbohydrates. Dr. Beebe suggested we try a dehydrated food to reduce carbs and balance protein with increased greens and other healthy, unprocessed ingredients. We are currently trying two varieties of Honest Kitchen dehydrated food – Embark (a complete meal… just add water) and Preference (the base mix to which we add water and a protein of our choice). The food is incredibly easy to prepare – it hydrates in about 5 minutes - and the dogs LOVE it! Even Jenny, who is a bit of a picky eater, licks her bowl clean and then checks Jack’s bowl to see if he missed anything (he never does…). For protein, Evangers (www.evangersdogfood.com) offers several flavors including 100% chicken, turkey, rabbit, venison, duck, and others. A few small bites mixed with the dehydrated food, and the dogs are in heaven! The nice thing about adding Evangers is the variety it offers, including protein sources we otherwise wouldn’t be cooking at home. After two weeks, we see a real difference from this new diet. Eyes are bright, coats are luxurious, and stools are consistently good. What more could we want? Good news! Jack’s blood pressure this morning was pretty much normal, and his blood test came back with solid numbers. His anemia continues to be a mild concern, but everything else was okay. This week’s treatment (Treatment #6) is on-track, and he’ll have his first cyclophosphamide pills tonight at home, followed by a second dose tomorrow evening and the third dose Friday. We’re cautiously optimistic that he tolerates this drug as well as he did the first time. Cyclophosphamide needs to be accompanied with strong water intake, so we may end up ‘going out’ once or twice a night, but with dog doors to the backyard Jack can let himself out whenever he wants. Jack had a good day today! He spent most of the day in his chair (formerly Linda’s chair by the front window-Jack commandeered it years ago) but he also climbed up on our bed to nest at least once (we can tell from the covers he moves around to get comfortable). The fact that he can curl-up in the chair like he used to is a good sign. For a while there, he was so stiff he could only lay spread-out on the floor. Tomorrow morning we see Dr. Schneider for Jack’s weekly blood test and blood pressure check. If everything looks good, this week’s Treatment #6 involves pills he gets at home over the course of three days. He’s only had this drug once before and he handled it very well, so we’re keeping our fingers crossed for similar results this week. In the next few days we’ll “archive” our November blogs, so if you want to read further back, please go to the link on the left. Jack’s acupuncture went well this morning. He’s done it often enough now that the needles don’t really bother him and he waits patiently while they are in (about 20 minutes). After work, Jack took Linda and Jenny for a walk around the block. He wasn’t quite as energetic today as yesterday but still seemed to enjoy the fresh air and exercise. 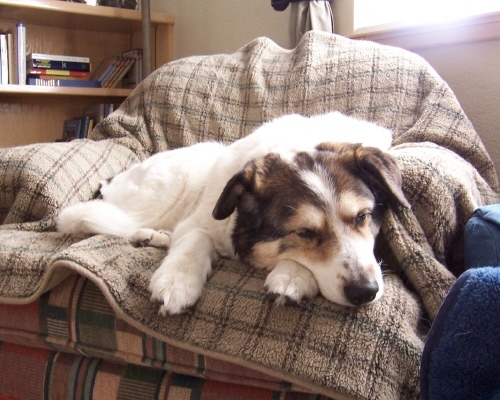 We’ve often talked about the multitude of Jack’s health issues (heart disease, lymphoma, high blood pressure, arthritis, anemia…) and whether his quality of life is still good. He’s always happy to see us, follows us around the house as we move from room to room, is happy to go for rides in the car, begs (successfully) for treats, and is excited for every meal. That tells us he still has a good quality of life. We’ve always believed that when they stop eating, that’s a big sign that they’ve had enough. Jack is no where near that point. We continue to hope that once we get through the weekly chemo treatments his anemia will begin to recover and his energy will return. We certainly didn’t go into this believing there would be no side effects from chemo… he hasn’t lost his coat – he hasn’t even lost his whiskers, which we read is common – and he’s never missed a meal. Nausea was the primary side effect we were warned about, and we’ve only noticed mild tummy upset on a couple of occasions. So onward and upward! We will do whatever we can to make him happy and try to keep him in remission. And we will continue to enjoy his company every day that he is with us. And as always, we appreciate your thoughts, prayers and good wishes. Today marks 7 weeks since Jack’s diagnosis… and he had a great day today! It was a beautiful morning, so Linda, Jack, and Jenny went for a short walk around the rather large block we live on. It wasn’t the full “Wrangler Loop” but still a good walk and Jack trotted almost the whole way. He spotted a cat in the shrubs in our front yard (which Jenny had missed, by the way), and up went his hackles as he barked a clear warning to vacate the premises. 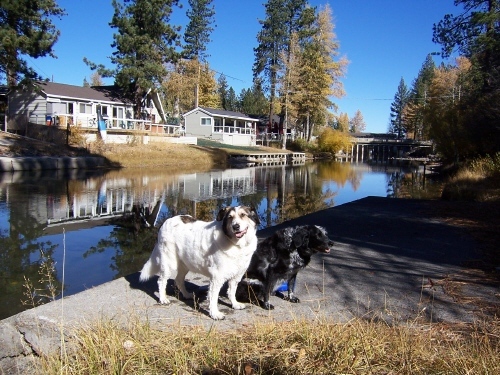 After the walk, we went for a ride up to Truckee then lunch at Squaw Valley, and home through Tahoe City. Jack was alert and obviously enjoyed the ride. He had only a short nap in the car, but otherwise was wide awake. This was a pleasant improvement in his activity level and demeanor since he’s been very tired for the last couple of days – yesterday’s walk was more of a “plod.” We think the Metacam (for arthritis) and Dr. Beebe’s herb pills (for his anemia) have started to kick-in, along with chemo Treatment #5 starting to wear-off. And, knock on wood, no nasal…discharge… for the last two days. Everybody in the house feels better about that! We’ve noticed that Jack’s gradually losing muscle tone in his hind legs, thanks to being tired and stiff. We haven’t been walking like we used to so his endurance is suffering. Whenever he’s feeling good, we want to get out and have a short walk to get those muscles moving. That, and going up and down his Petloader steps into and out of the car, should strengthen those legs again. Tomorrow morning is acupuncture with Dr. Rinehimer. Treatment #6 is on Wednesday. Yesterday was the best Thanksgiving we could have imagined. Jack felt good and helped Linda in the kitchen all day cooking The Giant Chicken (aka turkey). He served in the role of sous chef, keeping close eye on the oven and helping to remind her when to baste. Jenny played an important supporting role, spending equal time in the kitchen with Mom and in the backyard doing projects with Dad. 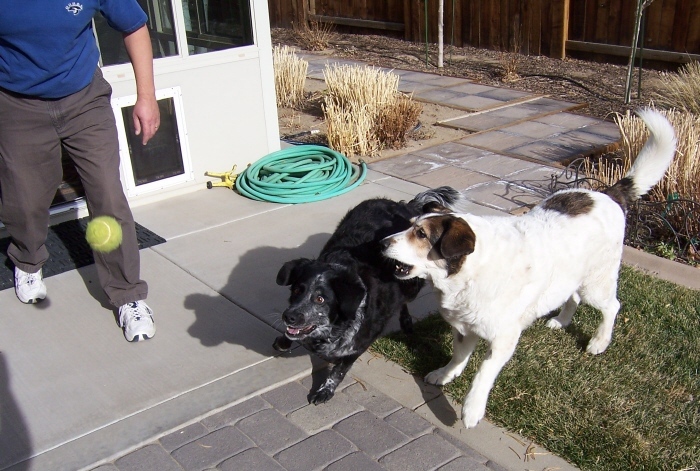 At one point, Jenny convinced Dad to play ball with her and without coaxing, Jack decided to join in. He hasn’t done that in several weeks. Here is a picture of the short yet spirited game. Jack’s version of “playing ball” is to chase the dog who is chasing the ball. The weather was beautiful – 58 degrees, sunny, and most importantly in this part of the world… NOT windy. Right before bed, Jack took himself out one last time and ended up rolling on his back in the grass. Yet another thing he hasn’t done in a while! His Vincristine injection (Treatment #5) on Wednesday evening went well. The blood test was okay – no reason to delay his treatment. Blood pressure was down although still a little high (possibly because he gets anxious every time we go to the vet). His anemia continues to get a bit worse with each chemo treatment. Dr. Schneider warned that it’s likely to keep getting worse as chemo continues. Dr. Beebe gave us some herbs to help, but he can’t have the herbs the day before, of, or for 48 hours after treatment, so he’s limited to 3 or 4 days a week. We’re hoping Jack continues to “hold his own” so we can finish this round of chemo and stay in remission. However, with the anemia getting worse he also tires more easily. No Blog tonight – we will update over the holiday weekend as time permits. Jack had a good day today. He slept well and this morning was excited for breakfast. When Linda got home for lunch, he was happy to see her and barked demands for his afternoon Kong toy. By evening – after work – he greeted her at the door and spun around with enthusiasm, then climbed happily up his steps into the Subaru for an evening ride… complete with barking up the bunnies in our neighborhood park. We haven’t commented on an ongoing and slightly gross problem Jack’s been having lately. Without going into gruesome detail, let’s just say that we’ve suspected he might have a sinus infection. He hasn’t had a bloody nose (knock on wood), but there has been some… discharge. It’s become more frequent in the last few days and we planned to ask Dr. Schneider tomorrow if he needs antibiotics. Jack’s always had environmental allergies, and this summer he acted like he had post-nasal drip. Since chemo suppresses the immune system, it made sense to us that maybe this turned into a sinus infection. We’ve learned to always carry a tissue in our pockets. But today we’ve seen no signs of the… discharge, which is great news. We’re keeping our fingers crossed that he’s over it and won’t need to take any additional medications! Tomorrow is Treatment #5, complete with a quick blood test (for white cell count) and blood pressure check. Most of you will probably not check the blog for the next several days, so on behalf of Jack, Jenny, Linda, and John, we want to wish everyone a very Happy Thanksgiving! We have a lot to be thankful for in our house this year. Acupuncture with Dr. Rinehimer went very well this morning. The needles didn’t bother Jack as much as they sometimes do, and they didn’t inhibit his ability to work her over for a cookie treat. We’re anxious for our appointment on Wednesday with Dr. Schneider… in addition to his chemo treatment, she’ll check his blood pressure. It was very high last week so we increased one of his heart medications. He’s been so laid-back lately, we want to make sure it’s not too low! Jack’s appetite remains strong and he really likes the dehydrated diet that Dr. Beebe (the integrative/holistic vet) suggested we try. Jack still gets some canned food for pill distribution, so we’re not on the dehydrated diet completely. But it adds a lot of the healthy foods Dr. Beebe wants to see in his diet to round-out the otherwise higher protein food. After all, when you remove most of the carbohydrates, protein is generally what’s left and while older dogs need protein, we have to be careful to balance it. Diet has always been a dilemma for us, but hopefully Dr. Beebe has put us on the right track. We learned early on that carbohydrates feed cancer cells, so it’s important to reduce them in the diet as well. The brand we’re using right now is Honest Kitchen, which offers several different types – some gluten-free, some low- or no-carbs, some are complete meals, and others have everything but the protein and you add the fresh protein of choice. We simply add some warm (filtered!) water and let it sit for about 5-10 minutes, and voila! A tasty meal ready to serve. Here we are, six weeks after diagnosis and Jack is still with us. Better than just getting by, he’s going strong and enjoying life thanks to the coordinated efforts of a whole team of really smart people. We are very grateful for all they have done, and continue to do, for Jack. Has it been stressful? Sure. A bit of an emotional rollercoaster? You bet. Are there times it feels like our checkbook is hemorrhaging cash? Absolutely. Regrets? None. Considering that Jack’s prognosis at diagnosis was 4 – 6 weeks without treatment, tomorrow begins ‘bonus time.’ We’re celebrating with an acupuncture treatment Monday morning, and then resting up for the start of the second round of chemo – Treatment #5 – Wednesday afternoon. Yesterday’s big winds have moved on and been replaced by cold temperatures and clear, sunny skies. There’s no better way to spend a Saturday than a shopping trip to Reno, a nice walk on our favorite trail, meeting and greeting all of our dog friends, and then settling into our chair for a long afternoon nap. Life with a cancer dog doesn’t get any better than this. John and Linda were off work today and spent a nice day with Jack and Jenny. Originally we hoped to go to Monterey for the weekend – Jack’s favorite vacation destination – but we decided not to push it and chose instead to have a restful weekend at home. Jack slept well last night for the first night in a while and was very relaxed and happy today. This morning he rolled on his back in the grass with his legs kicking in the air – another sign that he’s feeling much better. A storm is moving in and it was incredibly windy all day, so we didn’t get out much. Jack’s never been a fan of wind. Sometimes it’s just nice to have a quiet day at home. Dr. Schneider called with the results of his blood test, everything all looks good. There’s nothing to worry about at this point. In addition to the usual CBC test for white cell counts, platelets, anemia, etc., we also did a chemistry panel to see how his kidneys and liver are functioning. The tests show that all is well and we are very grateful. Kudos to Dr. Rebhun at UC Davis vet school! After consulting with him about the “gusher” incident last Friday night (aka Jack’s nose bleed), he suggested checking Jack’s blood pressure. Sure enough, it is alarmingly high. Jack is already on medication for hypertension, so we didn’t think it was possible that he would have high blood pressure… but he does. So Dr. Schneider increased his dose of the medication he’s already on, and will re-check next week. This certainly is a development we didn’t see coming, but would possibly explain the nose bleed. Hopefully he’ll be able to tolerate the higher dose of medication and it will solve the problem. And hopefully, we won’t have another gusher in our future! If the last few months have taught us anything, it’s to just roll with the punches. Linda used to ask the vet “Where am I on the Freak-Out Scale?” with 10 being a total freak-out and 1 being nothing to worry about. With heart disease, lymphoma, chemo, and all of the recent developments, we’ve abandoned the scale. After all, freaking-out doesn’t really accomplish anything. The acupuncture visit went well. If we didn’t see the results for ourselves, we would never believe it. Tonight when we got home, Jack headed into the back lawn and lowered his shoulder and chin into the grass for a good rub. He’s been trying to do that for about 10 days but always pulls up because it hurt. Tonight was the first time in about 2 weeks that he was able to do it! After only one treatment! He’s also stretching his shoulders and hips better than he had. Like I said, we would never have believed it if we didn’t see it ourselves. Jack’s next acupuncture treatment is scheduled for Monday morning to be 48 hours before chemo Treatment #5 on Wednesday. Jack was very restless last night, which means no one in the house slept well. We think any side effects from the mitoxantrone treatment last week are peaking now plus he’s stiff. As hard as it is to have these “down” times, it’s amazing to see him have such a great appetite with all input and output just as it should be! Today when Linda got home from work, Jack took the opportunity to initiate a brief play session Jenny. She was happy to oblige, but when things started to get a little spirited Linda had to put a stop to it because, well… we’re just a little bit paranoid now about the whole nose bleed thing. We’d hate to see them play and end up with another gusher. It was definitely a relief to see Jack feel a little playful. We look forward to his acupuncture tomorrow to see if that will help his arthritis, and are curious and anxious about the next blood test. Today was his last dose of prednisone. So far, two of the nutritional aids from Dr. Beebe seem to be working well but it might be too soon to see the results on the blood panel. We’re keeping our fingers crossed. Not much new to report today. Jack is still fatigued, but seems a bit more animated and bright tonight. The peak time for side-effects (Nadir) of last week’s chemo drug is about 7 to 10 days… and we’re only 5 days into it so we don’t really expect to see improvement for a few more days. We went for a walk after work and he wasn’t too interested, but he’s also not taking anything for pain or inflammation right now. We have an appointment with Dr. Rinehimer on Thursday for acupuncture and are anxious to try it again. We’ve also started implementing some of Dr. Beebe’s nutrition recommendations but are cautious to not do too much too soon. Jack’s appetite remains strong and he’s drinking plenty of water – both good signs. We did, however, finally find the one food that Jack does not like: celery. But really, who can blame him? Another big day for Jack – today he met Dr. Beebe, an Integrative Veterinarian in Sacramento. She combines Eastern and Western medicine in her practice, and gave us invaluable advice on nutrition to help Jack cope with the effects of his chemo treatments. This is the final piece of the ‘puzzle’ so to speak. We’re anxious to try her recommendations and we’ll let you know how it goes. Meanwhile, Jack is exhausted today – four days after mitoxantrone. It’s a good thing he gets this week off to recover. Five weeks since diagnosis and we are thrilled to still be enjoying Jack’s company. Five weeks ago he was given 4 – 6 weeks to live if we did nothing, and after four chemotherapy treatments he’s happy, alert, hungry (always…) and generally acting like his usual goofy self. There have been side affects from the chemo but nothing severe enough to diminish his quality of life. The most notable has been fatigue that sets on 2-3 days after a treatment and lasts 36 – 48 hours…a small price to pay in our opinion. Linda has been working on the Resources page, so if you have a minute, please take a look. We will try to keep it current with updates from time to time as new things come along. No treatment this week – Jack gets a week off to ‘rest’ and allow his system to stabilize. Treatment #5 is scheduled for November 25th. Blood. Everywhere. Who knew there was that much blood in a dog’s nose? We had settled in to watch a movie Friday night to celebrate Jack’s remission and before it was over we noticed he was lying on the tile by the front door making a strange licking sound. A quick glance revealed a huge pool of blood, apparently coming from his nose. The movie was abruptly turned off and all hands were mustered to determine the cause and source of all that blood. In the process, Jack got up and started walking around…sneezing and shaking his head. Blood went everywhere – our house looked like a crime scene. Linda quickly called the UC Davis emergency number (9:30PM) to see if this was a possible side effect of Thursday’s mitoxantrone treatment. Their response was to have Jack’s platelets checked as soon as possible. One of the big concerns with chemo is low platelets and an inability for the blood to clot. Next we called the local Vet Emergency Care center (Reno) with a retelling of the long story of Jack’s medical history, chemo, etc. Their advice: put a cold pack on his nose – frozen peas, that sort of thing, and see if the bleeding stops. If it didn’t stop in 20 minutes, he needed to go in. 10 minutes later (10:00 PM) the nose was still flowing, so everybody loaded into the car and off to Reno we went. The emergency care center was able to do a complete blood panel and determined his platelets were a little low, but nothing to worry about. Actually, everything checked out “normal” or nearly so…no obvious explanation for the bloody nose was forthcoming. Their advice: have X-rays done to see if there was a tumor in his sinuses. So we thanked everyone for their care, loaded up the car and arrived back home (after hitting the In-‘N-Out drive-thru) at 1:00 AM. By the time we arrived home, the bleeding had nearly stopped – it was just an occasional drip here and there. By noon today it had finally stopped. This afternoon Jack went to his regular vet hospital for X-rays with Dr. Skogerson and upon review there were no obvious ‘issues’ to be found. The films are being sent to a radiologist just to be sure. So at this point, we believe the nose bleed was ‘trauma induced’ – somehow unbeknownst to us, Jack hit his nose on the corner of the wall where he was sleeping and all other factors being what they are, the rest was history. This evening he is back to being his usual goofy self, good appetite, etc, and other than acting a little fatigued (like everyone else in the house) he seems none the worse for wear. In a follow-up email today the UC Davis oncologists confirmed that they believe Jack is in a complete remission. Can’t get better news than that on Friday the 13th! What a busy 24-hours we’ve had…Jack had three walks on Wednesday and enjoyed each one – 6 weeks ago he didn’t have any energy or interest in one walk per day. We loaded up the Subaru and headed for Davis Wednesday evening in the hope that we would be ahead of the storm. Sure enough, the road was dry and traffic was light, and we arrived safe and sound around 8:30 PM. Jack’s sleeping is getting much better – in fact he was the only one of the group who appeared to get a good nights rest in the hotel. The rest of us were not so lucky. Linda was pleased to report that when she was up around midnight it was raining, but by morning the storm had passed and the day was sunny. We watched the local news report with video of the overnight snow in the Sierra and were happy that we drove down early. UC Davis vet school is a pretty amazing place. The folks who work there are some of the best on the planet at what they do, and we’re fortunate to be able to have their resources close enough that they can help Jack. His treatment today took about three hours so while Jack was in the slammer, Jenny got a big walk on campus through the arboretum. After our walk, John and Linda had a nice lunch at a quaint little place downtown. Then again, pretty much the entire downtown Davis can be described as quaint. Jack was finished by 1:00 and we headed back to pick him up. By the time we headed for home he was one happy, tired pup. The reduced dose of prednisone is making a big difference for Jack. The panting is much less and last night he slept reasonably well! Hopefully this week he’ll go off that drug completely. Thursday is Treatment #4 at UC Davis and we had planned to leave early that morning for the 3‑hour drive. The weather experts are now predicting a storm to come in Wednesday evening and most of Thursday, bringing snow to the Sierra. Since we can’t risk missing our appointment we may drive down tomorrow after work (no holiday for John) ahead of the storm. We’ve never had trouble in our Subaru – we’ve driven over passes that have closed behind us in severe storms – but you never know about accidents, delays, or closures. So, there might not be a blog update tomorrow night. Today, however, was a good day for Jack. Grandma came down to spend some time with the dogs and she reports they were alert and happy. When Linda got home after work, she and the dogs walked the Wrangler Loop and again Jack trotted pretty much the whole way. 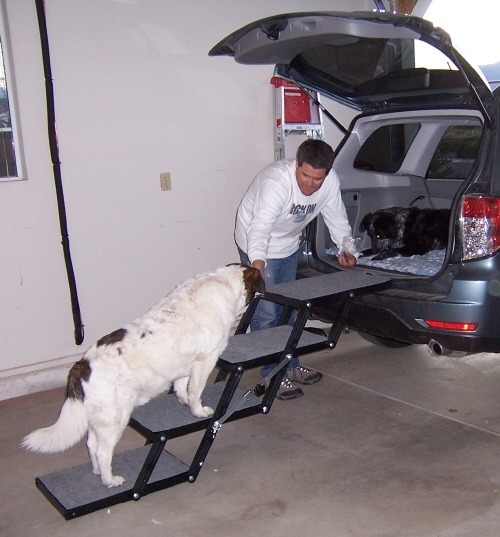 Once John arrives, we’ll practice using the new steps since Jack will have to use them a lot on this trip. We’ll tell you all about it when we return from Davis! Please think good thoughts that this treatment goes well. This is the only drug in the protocol that Jack hasn’t had yet; and we’re always a little anxious with each new treatment. Four weeks since diagnosis – and going strong. Today is the third day after Treatment #3 – Vincristine – the second time Jack has had this drug. We took it easy today, his appetite remains strong, and this afternoon he took Linda and Jenny for a trot around the Wrangler Loop. After the first Vincristine treatment he had a bit of tummy upset three days out, and the same is true this time. Nothing major, just something for us to watch with future use of this drug. One of Jack’s friends, Sadie the Golden Retriever (and her owner George) stopped by to say hello. Jack was happy to see them, and George commented he thought Jack looked good for a guy on chemo. Jack was tired today and had several good naps. This morning was the first time he didn’t want his chewable heart pill, but he soon took it with a bit of goat cheese slathered on it (have we mentioned how much we LOVE goat cheese?). We thought perhaps he was experiencing some nausea, but when it came time to actually eat his meals, he ate with enthusiasm. Sometimes taking medication will make your taste buds do strange things, so maybe his Vincristine injection this week had this effect. As long as he’s eating and drinking, we won’t worry. Despite being tired, Jack surprised us today with one of his favorite games: catching kibble out of thin air. He’s always had good mouth-eye coordination and can catch a piece of kibble being tossed at him. We managed to get a picture of this today in our patio room. It’s an amazing thing to see in person. He also surprised us by initiating a rousing play session with Jenny – it didn’t last very long, but it was spirited while it lasted! Jenny and Linda headed out this afternoon for a trip to our local pet food store, Sierra le Bone, to stock up on a few things. Jenny is a confident girl and never shies away from anything, but we’ve noticed that she takes her cues from Jack and when he’s not around, she almost seems…lost. We’re trying to give her some time alone with us to realize that she’s okay without him. The ladies at Sierra le Bone made the appropriate fuss when Jenny came in the store and gave her some yummy treats. Jenny seemed happy for the outing. One other comment about Jenny: She’s one of those dogs who can sniff out and sense when something is wrong. For example, she’s the first one to tell us if Jack has an ear infection – long before he starts rubbing his head or scratching at his ear. In 5 years with us, she’s never been wrong. Even after his first acupuncture treatment, she knew something was different about him and sniffed him for a long while. It’s pretty amazing to watch her and we’ve learned to rely on her instincts. We think Jenny is one of those dogs who would be good at sniffing out cancer or detecting the onset of seizures. She’s got that gift. Needless to say, she’s been very worried about Jack. And if we’re worried, she picks up on that, too. In fact, she’s had an upset tummy for over a week and we’re convinced it’s stress – she’s worried about him and us. We’re doing our level best not to give her any additional cause for concern, and to be as cheerful and “normal” as possible despite the unavoidable stress of lymphoma and chemo. Linda stayed home with Jack today because we don’t like the thought of leaving him home alone after a chemo treatment. For 48 hours after a treatment, we have to be diligent to clean up after him wearing latex gloves, since the chemo drugs can still be “active” as they work through for a couple of days (after that the drugs somehow neutralize in his system and aren’t active when they pass through). If he was an only dog, we probably wouldn’t worry too much, but we don’t want to take a chance that Jenny could get into anything. Usually, Jack’s Grandma Betty (Linda’s Mom) comes over to be with them after chemo, but she’s out of town this week. So Linda stayed home. Today was chemo Treatment #3, so off to the vet we went! Before Jack’s treatments, Dr. Schneider draws blood to check his platelets, white cell count, anemia level, etc. We can only proceed with chemo if everything on the blood test is a-okay… and it was! He’s still mildly anemic, but no worse than last week. Everything else looked good so we remain on schedule. I’m happy to report that Jack’s weight came down about 3 pounds from last week (I wish I could say the same for me), so we are approaching “normal” again. Ideally, he should be about 67 pounds. Last week we were at 72 (yikes!) but today he weighed 69. Much better. And tomorrow we reduce his prednisone dose, so the “FEED ME I’M STARVING” look we get about 11pm each night should subside. We’ll see over the next few days how he reacts to this injection, which is the same drug he had 2 weeks ago that made him tired and may have given him the red tongue that had us worried. He’s certainly not very fatigued now (compared to then), and his tongue is back to its normal pink color, so we’re curious to see how things unfold this weekend. If you’re keeping score – next week Wednesday morning is his next blood draw, and if all looks good, it’s off to UC Davis on Thursday for Treatment #4. Nothing new to report today as we get ready for Treatment #3 tomorrow afternoon. Let’s be honest. It’s hard to tell you much about Jack when the weekend is over and we have to head back to work. We’re not with him all day, so it’s tough to report much about his daily activities. Jack has never been much for toys. I don’t think he had them as a pup. Since he was a stray, Jack has always been more interested in food (Jenny’s the squeaky toy fanatic in the family). We found some great “kibble dispensing toys” that combine playtime, concentration, and food reward. Both Jenny and Jack really enjoy these toys. I bought them at Pawmark.com, but you can get them anywhere (we’ll post information about them on the “Favorites” page once we get that going). We refer to Jack’s toy as the “Flip-It” and Jenny’s is “The Egg.” You put kibble in each one, and they have to work to get the kibble out. For the last week, The Mugging has been very animated and demanding. They love those toys, and we think it takes them around 20-30 minutes to get the kibble out (given recent weight gains by everyone in the household, the amount of kibble in each toy has been reduced). Today when Linda got home, there was just enough daylight for a walk. Our usual walk of late is around a couple of blocks, which we refer to as “The Wrangler Loop.” Wrangler is the street that loops behind our house – the distance is about ½ mile. Jack hasn’t wanted to do the full Wrangler Loop in a while, but today he certainly did and he trotted the whole way. So knock on wood, today was another good day for Jack. We’re starting to get a bit nervous about his next chemo treatment on Thursday. It’s the same injection he had 2 weeks ago that resulted in a mild anemia. Please think good thoughts that he handles it well this week! First a big Thank You! to everyone who visited Jack’s Web site today. The site went ‘live’ last evening and the response has been amazing. Jack is very pleased. There are a few little things that Jack does that tell us he’s feeling pretty good. For some dogs it’s a good appetite or playing with a favorite toy – for Jack it’s sleeping belly-up on his bed or futon, rolling in the grass in the morning, and initiating play with Jenny. In the last two days, he’s done all of those things. Today was another good day! Three weeks since diagnosis. Jack is certainly feeling more like his old self, but thoughts of his lymphoma are never far from our minds. Over the last three weeks he has experienced some bouts of stomach upset that have been moderated with medication, and he rarely sleeps through the night without taking himself out once or twice as a function of his increased water intake. Unfortunately, once awake it sometimes takes him a while to get settled and go to sleep again. We are looking forward to tapering off the Pred over the next three weeks and are hopeful that will help his panting. While his energy level is dramatically improved over what he was experiencing three weeks ago, he still tires quicker than he used to but the spark is there and we’re optimistic that his energy level will continue to improve. Today was just too nice to stay home, so we piled in the car and headed to The Lake. After a nice walk at Incline Village we continued on around to Tahoe City for lunch and another nice walk along the Truckee River. Jack has always enjoyed the water, and today he went straight for a swim. While it was nice to see his enthusiasm, we did not bring along his beach towel, and the prospect of driving home enjoying the aroma of a soaking wet Jack in the car just wasn’t that appealing. So his swim was limited to more of a wading event and the ducks went unmolested. Better than nothing, I suppose. A quick note about Jack’s weight – it’s been very difficult to maintain his weight due to the affects of the Prednisone, as well as the chemotherapy drugs. Compounding this challenge has been his lack of exercise due to lethargy resulting in Jack being a bit ‘heavy’ right now. We expect that Jack will be getting his weight back under control shortly. Today was another good day for Jack. He slept well last night and was alert and animated all day. We don’t know if he’s in remission, but he is certainly acting more like his old self. Hips are a little stiff… we’ll be glad when Dr. Rinehimer returns from vacation to give him another acupuncture treatment. Meanwhile, he appears to be handling this week’s chemo pills without complication. Jack had an excellent day today! We drove over to Roseville for lunch and shopping, and then to Lincoln Hills for a walk on the trails. Jack was alert and happy in the car, and by the time we got to our walk, he surprised all of us by trotting almost a solid mile! That’s more energy than we’ve seen in a while. Jack also really likes the king-size pillow we put in the back of the car. 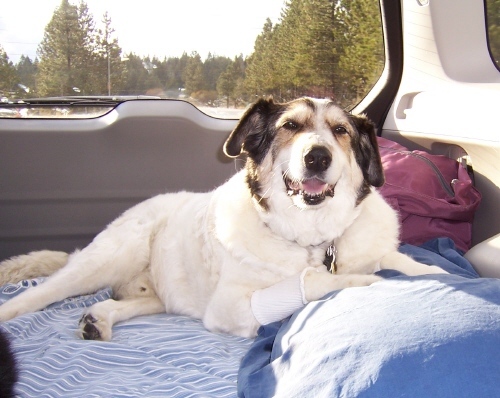 We thought it would help him get comfortable after his first Davis chemo treatment in a few weeks, so he isn’t rolling around or being jostled over the mountain roads. He leans against it comfortably with a big, goofy smile on his face. Today and tomorrow we’re off work for some R&R and to monitor Jack’s condition. This morning, Linda and Jenny decided they needed some ‘girl’ time so they headed for shopping in Reno. Meanwhile, Jack was feeling great. Treatment #2 went without a hitch, and we started some chores around the house. 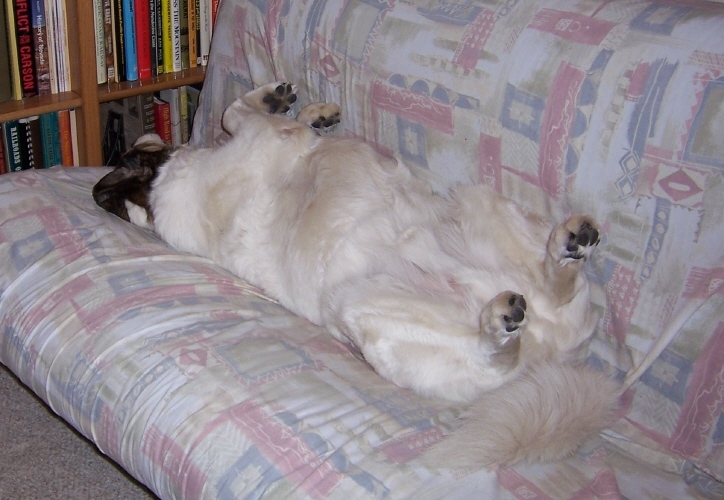 Jack napped on his futon – belly-up – then rolled over and was having one of those really great doggy dreams with all four paws twitching. After lunch we decided to go for a walk and Jack had quite a bit of energy. He trotted almost the entire walk, and was pulling to go farther when I turned us around and headed for home. No sense in over-doing a good thing. Jack’s appetite remains strong, and today he seems like his old self. Today was the day for Jack’s second chemo drug – pills that he needs to take once per day for the next three days. We can give them at home provided we take the necessary precautions: don’t break a tablet open, don’t let him chew a tablet, wear latex gloves (us not him). Jack hit the vet’s office at 8:00 AM sharp for his blood draw and general ‘once-over.’ The idea was that an early blood draw would mean the results would be back by mid-afternoon and we would know if there was any reason he couldn’t have this treatment. Sure enough, the results came back and while his platelet and white cell counts were good, he was borderline-anemic. He’s been at the low end of ‘normal’ before so this is nothing new for him, but just to be safe, UCD Dr. R. was consulted. UCD Dr. R. gave us the green light in the evening, but too late to give with food so we agreed to commence Treatment #2 in the morning. We started Jack on metronidazole for his upset tummy and have seen immediate improvement. Today his stool is very soft and by evening it was runny. Not sure what’s up with that. I e-mailed Dr. R in Davis and asked if it’s his chemo drug working its way out. He thought the drug would have processed out a couple of days ago and this might just be a little GI cramping. Tomorrow Jack sees Dr. Schneider for a blood panel and his next round of chemo (which is a set of pills that he will take at home). She’s going to check him thoroughly to make sure he’s well enough to handle the treatment. I’ve heard of cases where they have to skip a week to let the dog recover from the previous treatment, but I hope that doesn't happen quite so soon! We’ll see what she says in the morning. Otherwise, this evening he’s much calmer than in previous days and his eyes don’t seem quite as… anxious. Rough night last night. Jack seemed overheated - panting non-stop. We were up several times to let him out - he peed every time - and for a midnight snack. Eventually he wandered out and laid on the cool tile in the entry way and fell asleep. According to Dr. Schneider the panting is from the prednisone; fortunately we begin reducing the dose in two days. His increased hunger is also due to the pred. It's an amazing drug with really nasty side effects. Surprisingly, his fur is growing back where his arm was shaved for his first treatment. His resting respiratory rate continues to be low, only 16 to 20 per minute, and he's not coughing - a good sign for his heart. After work we took a walk up the street and Jack seemed to perk up - he trotted quite a bit, and seemed to enjoy the fresh air. After, we went for a ride to our favorite taqueria and he was up, barking at select targets along the way. On the way home we cruised by the park and barked up the bunnies grazing in the grass. Today is another day for and with Jack - two weeks since being diagnosed with lymphoma. Clearly he feels no worse than he did then, and often he feels better. We went for a ride to Reno, and walked on the trails around the wetlands. This is one of Jack's favorite walks and he surprised us both with is energy level. He trotted more than we expected, and while still showing signs of fatigue today, he has more energy than he did yesterday. At supper time we noticed that his tongue was redder than usual. A quick call to UCD Emergency to verify that this was nothing to panic over, probably a side effect of his increased panting from being on Pred. and we need to take his temp. just to be sure. His appetite remains as strong as ever; no sign of nausea, and all the plumbing is working as designed. Beautiful fall day so we decided to take a ride over Ebbetts Pass (Hwy 4) to see the fall colors and have lunch at one of our favorite places; pizza at The Growler in Arnold, CA. Jack's dosage level of Prednisone is lower than "usual" due to his heart, but it's still making him drink and drain more than we're accustomed. So we took it easy and stopped a lot. It became clear early on that Jack was fatigued today. At our 'rest' stops, he would jump out of the car and just walk and sniff around - no running, no trotting, just walk, stand, sniff, pee, repeat. 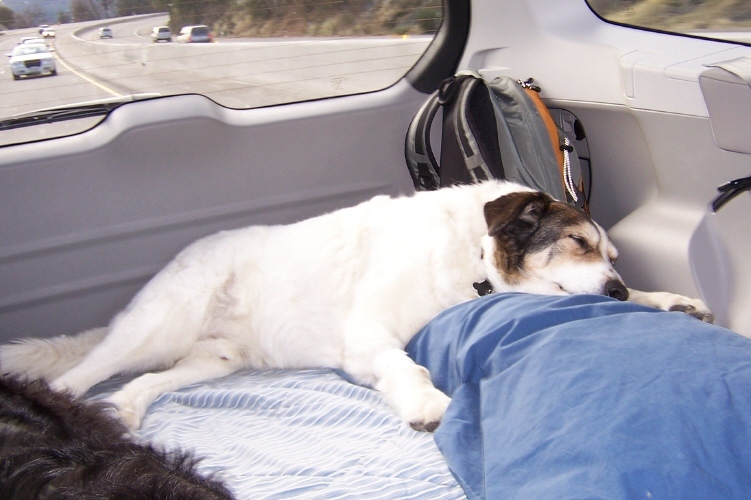 He jumped back in the car easily enough, but from the start of the trip he just seemed worn out. Odd, considering that he had a pretty relaxing day on Friday. As the day went along, he seemed to become more energized, barking at M/C's and UPS Trucks, and by the time we were crossing back over Ebbetts he was standing with his head out the window for extended periods. Jack really does enjoy rides in the car. Took the day off to be with Jack - to see how he's doing two days after his first chemo treatment. His appetite remains strong, no sign of nausea, no vomiting, no diarrhea. First thing in the morning, while I was checking my email and doing some research online, Jack jumped onto his futon and promptly rolled belly-up and went to sleep. Rolling belly-up has always been something he does when he feels good - or more to the point, something he doesn't do when he's feeling lousy. I took a photo and emailed to Linda - cause for celebration. We took it pretty easy all day, and he went belly-up on his futon two more times, as well as taking a nap in his chair. Not a lot of activity today, but something to be pleased with nonetheless. Jack slept well last night – there are no obvious signs of any distress from the treatment. Just to be safe, grandma came down and spent the day with him while we were at work. She took him for a ride and he seemed to enjoy himself. Otherwise, a completely uneventful day – just what we wanted for the day after a chemo treatment. Today is Jack's first chemo treatment - an injection given by Dr. Schneider at 4:30. Jack is full of energy and enthusiasm in the morning - barking for his breakfast and running through the house for his flip-it. At lunch it's discovered that he 'nested' on the 'guys' side of the bed - something he used to do regularly but has only done once in the last few months. This, along with sleeping belly-up and rolling in the grass, is a behavior we associate with him feeling 'good.' It is a beautiful, calm, sunny and warm fall day. Jack to vet for pre-chemo chest X-ray and acupuncture for his hips. As of today, on track to start the chemo protocol on Wednesday with Dr. Schneider. The X-ray came back showing nothing we didn't already know - enlarged heart, lungs are clear, no signs that the cancer metastasized. Jack is feeling great today after his acupuncture. Unfortunately, Dr. Hope is going on vacation for 3 weeks so it will be a month before he can have his next acupuncture treatment. Ride to Sacramento - lunch in Davis. After lunch, walk on campus, for the second day in a row Jack is walking with more energy and enthusiasm than we've seen in a long time. He trots most of the walk, head up, alert, looking for squirrels. This is a huge improvement over what we saw last week Saturday evening when we where here. The Preds are doing their job. We all enjoy a nice side of roast turkey from Pluto's. This is Jack's third trip to Davis in 7 days...Jenny thinks we should move there. "Picnic lunch" in the park in Gardnerville, then a nice ride to Reno to Scraps Dog Company for another diet consultation. From Reno over Mt. Rose to Incline and a walk on the path. This is one of his favorite places and he walks with more energy and enthusiasm than we've seen in quite a while. Clearly he's feeling better. Jack to vet with Jenny (lump on back of her foot aspirated) - after just two doses of Prednisone vet notices remarkable shrinkage of lymph nodes in his neck. Dare to dream that the Preds are working…50 - 60% of all dogs see complete remission from the Preds...hopefully Jack is a "60%-er." Jack begins taking daily dose of Prednisone steroid to reduce swelling - best possible outcome - Pred drives Lymphoma into remission prior to start of Chemo. We had to wait until today to begin the Pred so the Metacam (anti-inflammatory) was completely out of his system. It is decided that we will try the chemo - treatments to begin (tentatively) next week Wednesday, October 21. As of today - Jack is NOT dying of lymphoma, he's LIVING WITH lymphoma. Jack is diagnosed with Acute Lymphoma after our return from a nice road-trip to Healdsburg wine country and over-night in Davis. He is clearly fatigued with very low energy level - he hardly had enough energy to walk from the hotel in Davis over to the campus quad and back.